Well I have to say, I’m very pleased THAT is over. Half term at the museums is horrendous. Apparently the museum had over 20,000 visitors on Monday and most of them were on the pavement outside. It wasn’t quite as bad for us today but the NHM next door had queues around all manner of corners. Here’s just a small section of the NHM queue. The queues on the footpath are bad enough but the constant stream through the underpass is extraordinary. No semblance of any kind of hurry, no sense of keeping to one side. And it’s not like I have a choice as the roads are all up! I went for a wander at lunchtime and noticed that the poor V&A was not doing quite so well. Mind you, according to Nick (my boss) they are quite happy not to have thousands of screaming children racing around the exhibits. They have a point. 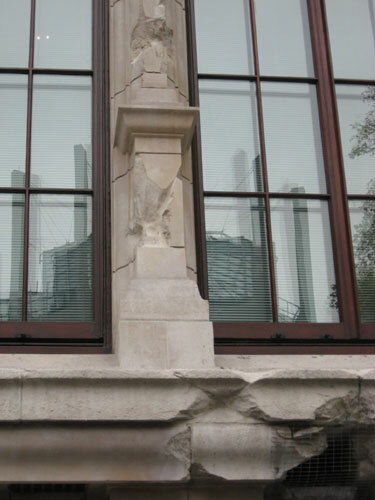 Speaking of the V&A…I noticed today that the building along Exhibition Road has some chunks missing. There’s also a sign which says the missing bits are a result of German bombs during the Blitz. I’m amazed they didn’t do more damage. Here’s just one little bit of it. The child looked a bit shocked and then said he’d changed his mind. There was only Barbara and me there today. That means it was very, very quiet. Until just after lunch. And then the crisps came out. Am I the ONLY person in the world that hates the sound of people eating crisps? I spent a good 10 minutes with my fingers in my ears. I was wishing I’d had the foresight to bring the iTouch with me today. Much rather listen to Wicked. Who am I kidding. I’d rather listen to some of Nicktor’s music! But these minor annoyances are nothing compared to my morning journey on the Tube. There are two things I hate on the Tube. Smelly people and noisy headphones. This morning I was surrounded by both. Clearly I should have smeared some crushed garlic on my toast this morning as everyone else had. It reminded me of those mornings at Qantas, taking the lift to the 40th floor and holding my breath the whole way, while Carmella crunched away on his cloves. And how come I never hear anyone listening to opera? It’s always some sort of thrash metal with its piercing, screeching, pipistrelle-like squeaks. Or pop? Or country and western? It’s always the same. Maybe it’s a thing. Like if you’re in a car it has to be gangsta rap. The oddest thing is that my earplugs do not bleed sound like so many bats at sunset. They’re not special. They are just ordinary earplugs. Maybe it’s the music, trying to escape. This gives me visions of the first bar of music hitting the ear and valiantly holding the bud up, out of the lug-hole so the next bars can fly through, looking for another, less blocked ear. The trouble is, the notes have to squeeze up so much, all the bass is washed out and they all become a shriek, screaming for release. I’m always amazed that the people with these noisy earplugs are totally unaware of how annoying they are. Very odd. It’s not like it isn’t mentioned a lot. Stand up comics are always mentioning it. I’m having a rare Friday Nicktor Night tonight. He wanted a Nicktor Saturday (which is the same as a Nicktor Night except it lasts about 24 hours) but he had to swing a deal with Dawn, who had already claimed the Saturday slot. Not with me, I hastened to clarify. Ah, the joys and necessary dealings of the children encumbered marriage. This entry was posted in Gary's Posts and tagged blitz, bombs, crisps, crowds, half-term, Nicktor, noise, smells, Tube, V&A. Bookmark the permalink. Ha! Genius. We had an evacuation a while ago and everyone went over the road and we had a phone call from the V&A thanking us when we re-opened.